My research source for this month is Phoenixmasonry, Inc., which holds the copyright to the source material. First, this degree, though similar in name, has no relationship to the Rosicrucian (Rosey Cross) Order which is a Christian Order with no Masonic connection. The name Rose Croix derives from the emblem of the Rose and the Cross. The degree has a distinctly Christian flavor and is said to have been given in some Encampments of Knights Templar. 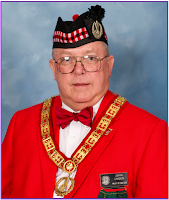 However, the degree resides in the Scottish Rite which is open to Masons of all religious beliefs. In the degree we are presented with a third Temple - the spiritual Temple which is the objective of Freemasonry. The pillars of Wisdom, Strength, and Beauty which supported the Temple of King Solomon are replaced with the Christian pillars of Faith, Hope, and Charity. The Three Great Lights remain as the essence of Freemasonry, but the lesser lights are replaced by thirty-three lights which are thought to represent the 33 years that Christ lived on earth. The Christian character continues in both the clothing worn by the officers conferring the degree and by the obligatory meeting days. In the conferral of the degree and at the Maundy Thursday observance, the Wise Master is vested as a bishop and the other officers as priests. The obligatory meeting days are Maundy Thursday and Easter Sunday. I first noticed the Christian nature of this degree 19 years ago when I first observed it. What is this (so obviously Christian degree) doing in the Scottish Rite? It doesn't bother me, but it does raise questions.